Over time your central heating system degrades due to the constant flow of water, creating deposits of sludge and rust which build up in your central heating system and can cause problems with your boiler, radiators and pipework. Powerflushing removes these deposits through the use of a purpose-built flushing machine and magnetic filtration system alongside specialised cleansing solutions. The process takes place inside your system so there is no mess to worry about and it can usually be completed in just one day. It is advisable to have your central heating system power flushed every 5-10 years, depending on the age and type of system. Why is sludge so bad for my central heating system? The debris that builds up inside a central heating system can cause cold radiators, pipework to become blocked and can even damage the internal parts of your boiler. By removing this debris you can prevent unnecessary damage, extend the life of your boiler and save you from having to spend money on repairs. ​Also a clean system has free flowing hot water, which means your boiler will work more efficiently, your house will be warmer and it can even reduce your energy bills. Before and after... An example of the magnetic sludge removed from a central heating system using our Magnacleanse powerflushing system. ​Magnetic central heating filters are designed to prevent the build up of debris and sludge from most central heating systems, using both magnetic and non-magnetic filters to remove any deposits as they occur. We recommend installing one of these filters to your system after having a powerflush, to maintain the health of your system and to prevent further build ups of sludge and debris. The filter is designed to stay in your system for many years but should be serviced annually for maximum efficiency. How do I know if my system needs to be powerflushed? The easiest way to check if you need a powerflush is to bleed a radiator. If you find dirty/smelly water comes out then this can indicate the build up of debris in your system, so power flushing may be recommended. 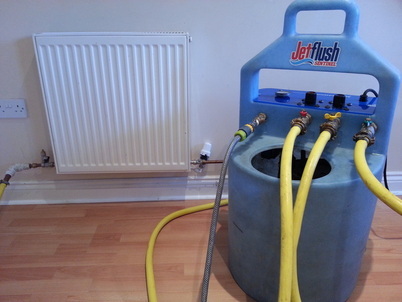 If you have noticed some or all of these problems in your home, or if you are still unsure about whether you need a powerflush, then why not call us today to arrange for a free no obligation quotation visit. Powerflushing a central heating system can help to save money on your energy bills as your boiler will run far more efficiently with clean water running through it, this is because the parts are under less pressure with the debris removed. Also clean water can reach a much higher temperature and heats up faster than dirty water, so after a power flush you should find that your house is warmer than before. The more efficient running of your central heating reduces the amount of energy being used, which can lower your energy bills and save you money. ​Do I need to have a power flush if I get a new boiler? We highly recommend having your existing system powerflushed when having a new boiler installed. If the existing debris is not removed from the system then it is likely to then cause damage to the new boiler. Also some boiler manufacturers require a powerflush to be completed in order to validate the warranty. We always include a power flush as standard with all of our boiler replacements and we then add an inhibitor solution to the system to prevent further degradation.